Here are some basic facts about how Spain's bailout compares to the previous ones. November of 2010: Ireland's bailout equates to 94% of bank capital. May of 2011: Portugal's bailout is 175% of bank capital. June of 2012: Spain's 100 billion euro bailout equates to 27% of bank-system capital and reserves. As reality sunk in, the sell-off started. 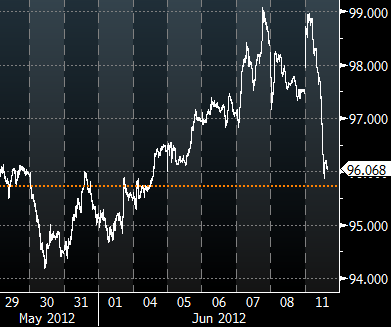 In a matter of 3 hours the Spanish 10-year bond lost 3 points. In addition, the markets are trying to digest the issue of subordination. The new rescue loans will be senior to the unsecured bonds of banks receiving assistance. Bloomberg: - If the cash were to come from the ESM, its treaty provides it with preferred creditor status, junior only to the International Monetary Fund. The EFSF isn’t explicitly a preferred creditor, prompting Finland’s Finance Minister Jutta Urpilainen to demand collateral if the facility were used to advance the money. Even so, the Greek example showed that official lenders aren’t willing to accept losses, preferring to force private bondholders to take greater writedowns in a restructuring. Just to add fuel to the fire, there is a possibility this subordination will end up triggering some bank CDS. It's going to be a rough week.